We had a great weekend in Miami. It was really nice to see friends and family. And of course, Kat & Lenny's wedding was beautiful. Unfortunately I also received some not so great news. 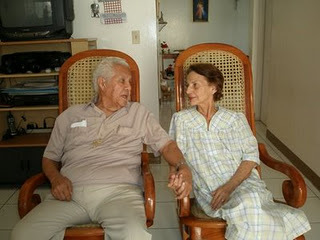 My mother called me yesterday, during the wedding reception, to tell me that my Abuelita Vilma had passed away. This is my dad's mom who lived in Nicaragua. She had been sick for some time now...my dad rushed out to Managua on Saturday because the doctor said she would probably be passing soon. I am glad I had the chance to visit her back in March. I wish I could have gone one last time. She was an incredibly amazing person. I have such fond memories of her... I know it is better for her now...she is no longer in pain from all the health issues that were ravaging her body and mind. But it's difficult for the rest of us that she's leaving behind. I haven't spoken with my dad yet...but I can only imagine how he must be feeling. And my grandfather...I mean, once you've been with someone for so long, it must be so lonely being without them. They had the kind of love that chick flicks are made of. ;-) They were the best real life example I've ever seen of what it means to love someone and be committed to them. They're burying my grandmother this morning in her hometown. I don't remember the name. I believe it's Jinotepe, but I'm not sure. I was trying to find a way that I could go and be with her this last time, but it didn't work out. Just pray for my family...especially my grandpa.